Are you a “lake” or an “ocean” person? I am a lake person. I grew up with a lake place just 20 miles from our permanent home in Wisconsin. We moved there every summer often staying into September if the weather was good, and I’d commute into school for the first couple weeks. The “lake house,” as we call it, has always been an important place for me. My memories are full of adolescent summers where I could go for days at a stretch without wearing shoes, where I learned the value of hard work – scraping and painting the garage, waxing the boat – where I could get lost in my thoughts staring out at the water in the early evening, where I enjoyed my parents’ friends at frequent bbq’s…. I could go on and on. I wonder if the Sea (or really lake) of Galilee held a similar spot in the minds and hearts of the disciples. It was there that Jesus recruited his first disciples, gave the Sermon on the Mount, fed the five thousand. He and his disciples crossed its waters many times as they traveled through the region. And yet while for me a story like this conjures up images of “the beloved lake house” and all it’s adventures; for the disciples at the time, and the first Christians who would tell and retell it, this little story of the disciples caught in a storm on the Sea would bring to their minds a different set of images. Put these pictures together and we can begin to understand the fear the disciples were feeling in the boat with Jesus when the storm came up. At thirteen miles long and eight miles wide, the lake would seem rather small to experience a storm as violent as the one Mark tells us about. However, the Sea of Galilee, surrounded by high mountains, is like a basin. It was and still is prone to sudden and sometimes violent storms. Winds from the southwest enter the basin through a break in the mountains and create a situation in which storm and calm come one right after the other. Have you ever been on the water as a storm approaches? Even in the fastest motorized boats, it can be very frightening. And so we can imagine how frightened the disciples must have been. The sea was, for them, the dark power of evil, threatening to destroy God’s good creation, God’s people, and God’s purposes. In books like Daniel, the sea is even where the monsters come from. So when Jesus rescues the disciples from a storm, we are witnessing something which says, in concrete terms, what the parables say in word-pictures: God’s sovereign power is being unleashed; God’s kingdom is at hand. Remember, this is the same power that made the world in the first place. And now this power is acting through Jesus. He is not some abstraction; He is the God who acts. He is the personal, living God who intervenes in the lives of people revealing his power and his will. And when he chooses to reveal himself, as in this episode, even the forces of nature submit. I love these stories – the ones where Jesus displays his power as God, where we see that Jesus is not only God’s Son but is God himself; and he does this in very personal and intimate settings and ways. These moments fly in the face of that popular Bette Midler song from the 90’s, From a Distance. God is watching us, from a distance. A couple years later (1995) Joan Osborne got a little closer to the truth with her song One of Us. What Joan missed is the fact that God WAS and IS one of us – Jesus. And Gospel stories like todays make that point clearly. God in Jesus acts in history, in the lives of the disciples, and in our lives. What an odd thing to ask of the God who can actually heal! Our God creates, saves, comforts, protects, transforms and loves not only the world, but each of us. These are the things we ought to be praying for. Though sometimes I wonder if we really believe this. Sure it sounds good in a sermon, but I think more often than not we’re like the disciples – tossed about on the waves in a storm, afraid and wondering why God is asleep in the corner. Sometimes the chaos is outside of us – financial pressures, kids leaving home for the first time, health concerns, accidents and misfortunes that seem to come one right after the other. And sometimes the chaos grows from within – a sense of restlessness in life; feelings of dissatisfaction and frustration with… fill in the blank: a job, a relationship, even the church. And often the chaos we experience is a little of both – external circumstances and internal unrest. And like the disciples, we’re afraid, or at the very least anxious; which a psychologist friend of mine told me is really just a fancy word for fear. And fear is crippling. Fear of loss, fear of failure, fear of being hurt – all these cripple us emotionally. But they need not cripple us spiritually. The disciples, in their fear, asked Jesus, “Teacher, do you not care that we are perishing?” Most likely, by the time they woke him, they’d had plenty of time to become frustrated at his deep sleep in their moment of crisis. Their plea is not, “Jesus, help us!” Rather they have fumed enough that they pose a rather snippy rhetorical question. I always feel bad for the disciples at this point; and I think they get a bad rap, from Jesus and from history on this. Of course they’re panicked and rude – they’re afraid for their lives! And Jesus, in response, criticizes their faith! Ouch! But this is where we can part company with the disciples, because we live on the other side of Easter. We know who Jesus is; we know that God has raised him from the dead; that he is who he says he is. He doesn’t just calm the storm; he calms our storms. Sometimes we expect that God will protect us from misfortune. We imagine that God will give us only happiness, health and prosperity – no thunderstorms, only days filled with sunshine. But that wouldn’t be real life and that wouldn’t be our real God. What God promises is that no matter what the circumstances are, we will not be left alone. He is not far away, simply watching. He is in the boat with us. 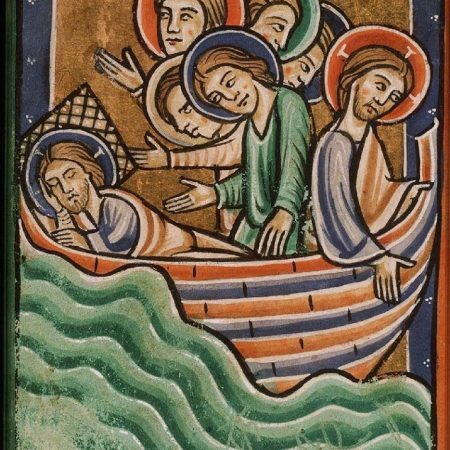 In fact Jesus is the one who invited us into the boat with him. The hymn we’ll sing at the end of worship today is Jesus Savior, Pilot Me. That’s another good prayer to pray. It reminds me of the silliness of that bumper sticker, “God is my co-pilot.” Because if God is my co-pilot, guess who’s the pilot! God wants us to move over and let him drive; because no matter how good we are, He is better. May this be true for us all, as individuals and as a church. God promises a calm after the storm. It’s coming… hang on… it’s coming.